This entry was posted in Fall 2018 by hlin. Bookmark the permalink. You give a good analysis of the rust belt and the Bronze Age and their similarities using history. What can archaeology of these areas tell us about their similarities and how they have risen/fallen? 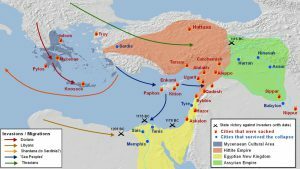 Delving deeper into the archaeology of the Late Bronze Age reveals more about both the effect of climate change and the human response. Pollen analysis of the Late Bronze Age revealed a dry period in the Southern Levant (Langgut 2013). As the continuous dry years compounded, crops failed and grazing opportunities decreased. As food prices rose without relief in sight, people migrated away in search of food. 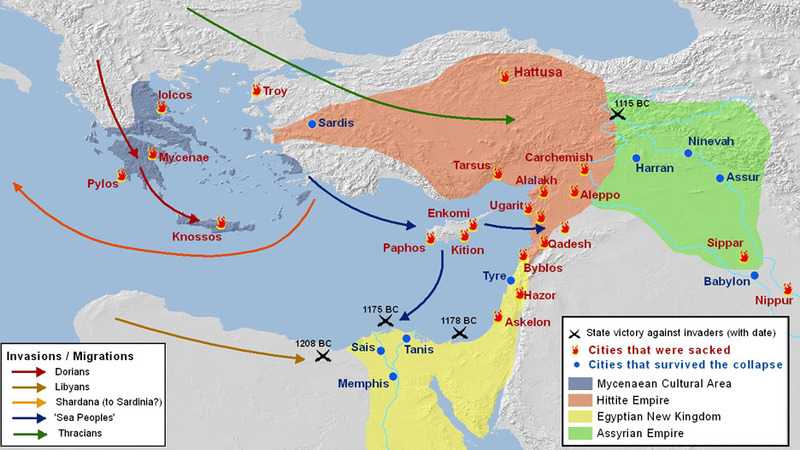 This rapid movement of human population then led to instability across the region, followed by a collapse of trade networks and states. A similar pattern can be found regarding population migration in the Rust Belt. Following decreases in economic opportunities, particularly, in manufacturing, the Rust Belt states have reported a net loss in population for the past decades. While this pattern is not as chaotic as the Bronze Age, the two perspectives support an important pattern of human history, where people are forced to adapt to changes in their environment. Looking at the two areas of history, we learn that people must either adapt to new conditions or not survive.